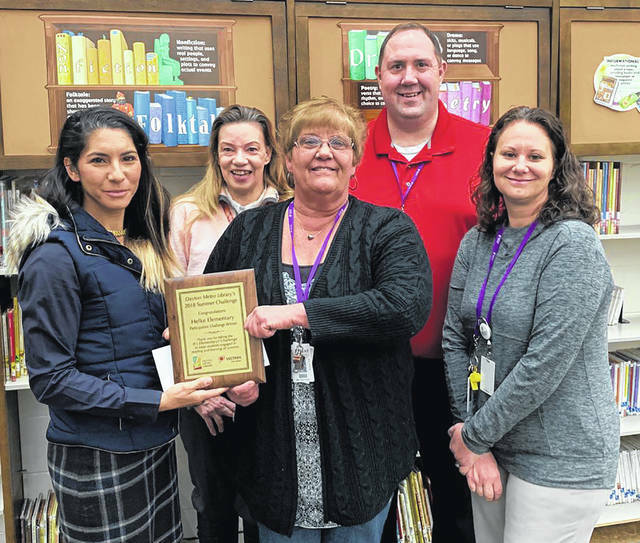 Helke Elementary School was recently recognized as a winner of the 2018 Summer Reading Challenge sponsored by the Dayton Metro Library and the Vectren Foundation. The “It’s Elementary! Challenge” is hosted annually by the library as a way to keep students engaged in reading and learning all summer. Helke had the highest percentage of our students enrolled and participating in the program of all Dayton-area schools and recorded over 2,227 hours of reading this summer. The school’s top reader recorded over 78.5 hours. Helke intends to use the $1,000 prize to fund an author visit to the school this spring. Pictured left to right are Rachel Goodspeed of the Vectren Foundation, Terri Stringer from the Vandalia Branch Library, and Diane VanHoose, Brian Tregoning, and Tifanie Vicars of Helke Elementary School.